Here is the new opportunity for all Indian Engineer candidates who are in search of a Government jobs in India under engineering stream. 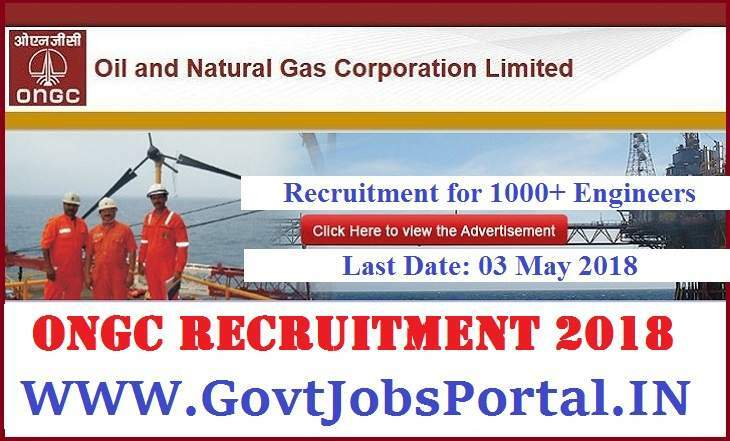 ONGC recruitment Department published an official Advertisement Notice on their website that they want to hire fresher Indian graduates under various engineering stream. ONGC is going to recruit Graduate Engineer in E1 grade. The candidates will be selected through the GATE 2018 test score. There will be a personal round of interview for final selection, all the selection will be done on the basis of GATE score and after that personal interview. There are total 1032 vacancies which are going to fill up through GATE Score. So score high in GATE and get a Job in ONGC department. More information related to this ONGC Recruitment is given below in this article; read the whole criteria related to these Engineering jobs before applying. Vacant Positions under this ONGC Recruitment 2018: 1032 posts. Age Bond: Only those candidates can apply for these Engineering jobs whose age must be less than 30 years. Education: Engineering Candidates who have completed their Graduation from any engineering stream can apply. Condition for GATE 2018: The interested and eligible candidates who have the essential education for the equivalent posts must have appeared in Graduate Aptitude Test in Engineering (GATE) 2018. The GATE-2018 Score in the subject mentioned against the posts of ONGC will be considered by ONGC for short listing the candidates for the further selection process of Personal Interview as per the criteria decided by the Management. What is the SELECTION PROCESS for these Engineering Jobs? GATE – 2018: The desirous and eligible candidates having the essential qualification for the advertised posts should have appeared in Graduate Aptitude Test in Engineering (GATE) 2018 as indicated above under education qualification. Those who are short-listed from Gate-Score will called for the personal interview round for final selection. How much is Application Fee to Be Paid? The General category Candidates who are which to apply these Engineering jobs under ONGC Recruitment process have to pay Rs.299, while all other Cat. Candidates need not to pay for applying these Jobs in India. The application fee is non-refundable to all candidates. What is the Procedure to Apply for this ONGC Recruitment 2018? Those who fulfill all the criteria which we explained above can apply for this ONGC Recruitment to grab a engineering jobs in India under Government sector. The process for applying these engineering jobs is to apply online through the ONGC official web-link. We share the link below for online application form. Just click on the given link below for application form. 16TH April 2018 is the Start Date to Apply. 3rd May 2018 is the Last Date to Apply.